On Monday, June 25, from 9-10 pm Eastern (6-7 Pacific), I'm participating in a Twitter Party with the wonderful women of Traveling Mom, sponsored by Travel Guard North America a leading travel insurance plan provider. Travel Guard's Gold Plan covers kids 17 and under for free, and is definitely worth checking out for additional peace of mind for your summer and adventure travel plans. You can RSVP at Traveling Mom to register for prizes during the Twitter Party. Join us on Monday night to share your adventure stories or your dreams of adventures-to-come! We're generally not the rugged outdoorsy types who enjoy rock-climbing, mountain biking, and other dangerous activities. To be honest, my idea of "roughing it" is a motel with no room service. Some of our trips have led to some unexpected adventures, and this story about our trip to Greenland in 2007, is one of my favorite examples. On our second day in Qaqortoq, Greenland, we got up early to catch a boat to the Norse ruins at Hvalsey. I had been reading Jane Smiley's historical novel, The Greenlanders , which is set during the 14th century and the waning years of the Norse colony in Greenland. The book follows the fortunes and misfortunes of one family of Norse settlers, and the toll that disease, famine, and climate change take on them over the years. Most of the book takes place in the fjords near where we were staying, and I was curious to see how the modern scene compared to what was described in the book. It's a terrific book, one that I highly recommend if you are interested in what might have happened to the Viking colonies that settled Greenland for 500 years, then just disappeared. We were supposed to meet our boat at the small dock at the bottom of the hill, and when we got there, there was a small cabin-cruiser waiting for us. We waited to see if a guide would join us, but didn't see anyone, so we just boarded the boat on our own. There was a thirty-ish Greenlandic woman on-board, a Danish man, and the captain, a handsome young Greenlandic man who looked a little like a weather-beaten Keanu Reeves. As we were getting ready to leave, two older men wearing painting overalls came aboard with buckets of paint and tools. I wondered if they were doing some work at the ruins, or if we were dropping them off en route. No one except the captain spoke English. The three men had an animated conversation in Danish, as cigarettes dangled from their lips. I hoped none of the bottles of paint thinner they were carrying would burst into flames, but I tend to worry like that. I asked Frank, "Are you sure this is the right boat?" just as the captain untied the boat from the dock. "I guess so. It's 8 am, and this is the only boat here." He showed me the e-mail confirmation of the time and the name of the boat landing. We figured they would probably let us know if they weren't expecting us. Captain Keanu invited us into the cabin and graciously offered us coffee. It was cold and misty outside, so we welcomed the chance to be inside the warm cabin. The Greenlandic woman stoically sat outside in the back for a while, but as we sped through the fjord, she got cold and came in. She didn't speak to anyone on the boat the entire time, so I figured she was most definitely not the tour guide. We were on the boat for about an hour and made a turn up another fjord, this one full of ice chunks and icebergs of varying sizes. We could hear the ka-chunk ka-chunk ka-chunk of the boat hitting the ice. 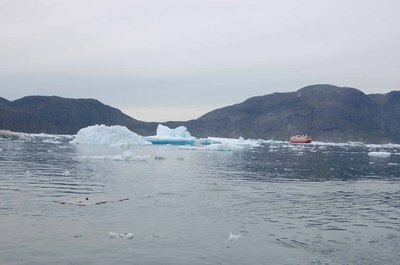 This sound scared me during the first boat trip we took through the icy waters of Ilulissat. By now, I was used to the sound and no longer feared that the ice was ripping the hull of the boat to shreds and that we were going to sink at any moment, like a mini-Titanic with no band. As we got further into the ice-covered fjord, Frank noticed a town up ahead, so he asked the captain, "When do we get to Hvalsey?" Captain Keanu looked at him blankly. "Hvalsey? This boat goes to Narsaq." "Narsaq? Do we go to Hvalsey Church after Narsaq?" Frank replied. "No. We never go to Hvalsey. Only Narsaq. I normally don't drive such a boat. I work on the passenger ship," the captain offered. "When do you go back?" Frank asked. "July 11. Next Tuesday," was the reply. Frank turned beet red and I thought he was going to have a stroke or a coronary right on the spot. Now I knew why we kept seeing ambulances parked at the docks. I started to worry. 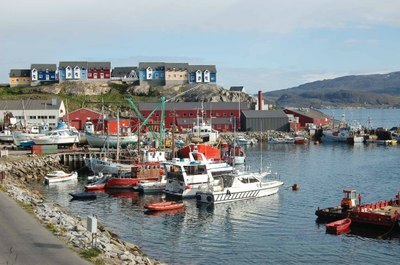 We pulled into the dock and the workers, the Greenlandic woman, and the Danish man got off, along with all the painting supplies. I decided to pipe up,"So, when will this boat go back to Qaqortoq?" "I don't know. You can get off if you want. Maybe the other captain will take you." "Who is the other captain?" I asked. "The other man who was here," he gestured to the seat at the table where the portly Danish man had been sitting. "Maybe he take you. Are you sure you won't get off?" I said, "No, thanks." There was no way I was getting off that boat without finding someone to take us back to Qaqortoq. I had a vision of Captain Keanu and the Danish captain each grabbing one of my legs and trying to pull me off the boat while I dug my nails into the starboard side. At this point, hijacking the boat and ka-chunk-ing it back through the icebergs myself would not have been out of the question. Frank looked worried and mopped his brow. Planning a trip to Spain with your kids? Jennifer at the delightful Orange Polka Dot offers some sage advice on traveling with kids or teens. In Spain, don't be surprised if you spot kids drinking something that looks like wine, either a few sips from mom or dad's glass, or a finger of wine in a glass of La Casera (soda water). Jennifer speculates that maybe it is a bottle that is just their size that delights them. Be forewarned that in Europe, wine does not carry the same taboo for youngsters that it does in the United States. Photito's Blog features gorgeous photographs of traveling with kids on the Iberian Peninsula, this time in Portugal. Portugal is definitely on my list of places to go now, especially after reading what Photito had to say. Surfing, sun, sand...when can we leave? We have great group of travel bloggers providing their expert tips and advice on traveling in this week's Carnival of Cities! Join our intrepid travelers as they scour the globe for interesting, fun, and just plain cool places to go and things to see. I'll be your tour guide this week. Starting out on the East Coast, for all you baseball fans, Christian Carollo presents Back to Back: Philadelphia Phillies posted at Christian Carollo Photography. Christian documents last year's World Series winners and hopes for a repeat performance. Will they or won't they? Yankee fans might beg to diffah (as we used to say when I lived in the Bronx), but the Phillies fans in Christian's photos look like they are ready to bring it home again. Moving down to Maryland, Jennifer takes us down on the farm with Homestead Farm – Poolesville, MD – You Capture Autumn posted at Two Kids and a Map. You can feel the fall nip in the air with her photos of a lovely pumpkin patch and cute kids. Traveling on south to Florida, Amy at The Q Family takes us on a tour of one of her family's favorite destinations with Disney's Animal Kingdom: The Condense Version posted at The Q Family Adventures Travel Blog. Amy also has some great tips for families traveling to Disney parks at the end of her post that you won't want to miss. Moving on to the midwest, and my former home in Chicago, Illinois, Dominique King takes us Inside the Chicago Cultural Center at Midwest Guest. I never got to see this when I lived in Chicago in the 1980's, and it's definitely a must-see next time I visit. Jack Norell reminded me of one of my favorite Chicago haunts in his post, Lincoln Park Zoo, Chicago over at Eyeflare Travel Articles and Tips. He has a gorgeous shot of kids meeting a polar bear that you just have to see to believe. I'd love to take my son there.